Today variety of sweet snacks are easily available or made at home.It was time back 25 years when sweets like cookies, chocolates, ice creams , deserts were not available easily.Cake was only bought for birthday once in a year only.So for that sweet cravings of children snacks like ladoos, shakkar pare, gujiyas were made at home. My mother used to make variety of ladoos for us , and i absolutely loved to eat them. Besan ladoo/ chickpeas flour balls are my favourite from the ladoo league.My mom used to add loads of dry fruits like cashew nuts , almonds in the this ladoo. I make this protein packed ladoo for my children as a school snacks. Its easiest ladoo to make and can be made using only three ingredients. 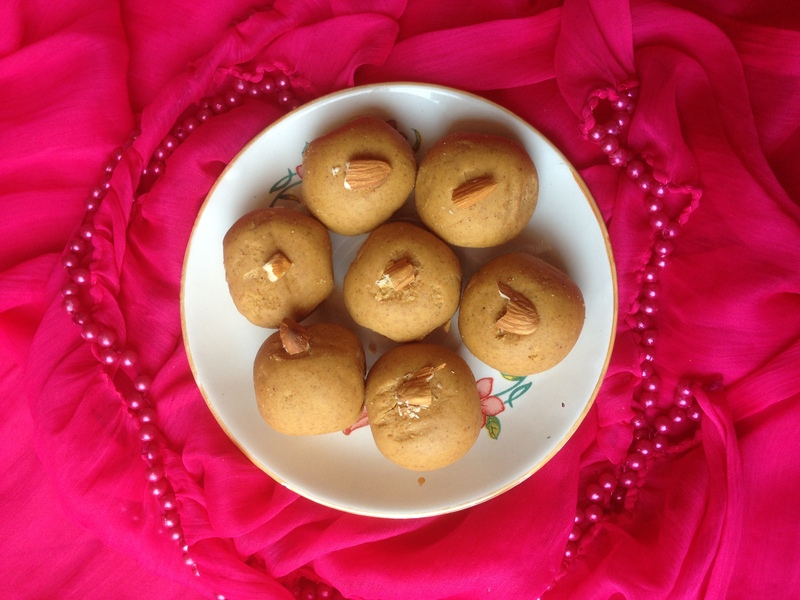 Only important step for making this besan ladoo is roasting besan (chickpeas flour). If it’s not roasted properly ladoo will stick while eating and won’t taste good. Dry fruits like cashews and almonds pieces are optional in the recipes.Enjoy making sweet chickpeas flour balls this festive season and let me know feed backs in comments section. Heat heavy bottom pan and add ghee in it. Add besan in pan and roast it while continuously stirring on low flame till nice nutty smell comes from besan. It takes around 20-25 minutes to roast besan. Once besan gets roasted completely switch off gas and add powdered sugar in it. Sprinkle cardamom powder on mixture and mix well. Let mixture cool down for few minutes to make ladoos. Form circular shaped balls by pressing warm besan mixture on hand by other hand.If balls don't get bound add more ghee to make it wet. Garnish besan ladoo with cut dry fruits and store in air tight container.